While there’s no shortage of information on restoring and maintaining the historical integrity of period homes, until now there has been no authoritative reference that provides comparable information for landscapes. 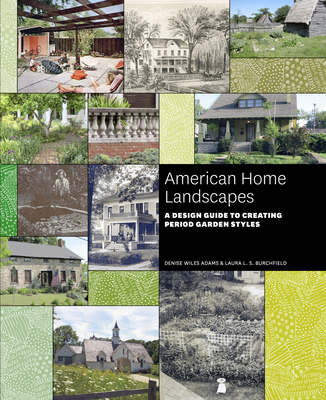 American Home Landscapes is a comprehensive, fully illustrated guide to recreating nearly 400 years of historical landscape design and adapting them to modern needs. You will first learn how to research design elements for a particular property. Each of the following chapters focuses on the design characteristics of six well-defined historical periods, beginning with the Colonial period and ending with the last decades of the twentieth century. Each section features the most prominent landscape features of each era, such as paths, driveways, fences, hedges, seating, and accessories. Extensive bibliographic resources and historically accurate plant lists round out the text. Whether the goal is to create a meticulously accurate period landscape or simply to evoke the look of a bygone era, you’ll find the tools you need in American Home Landscapes. Denise Wiles Adams is a highly respected historian of ornamental plants and American garden design. She has a Ph.D. in horticulture from The Ohio State University and is a prolific writer and lecturer on topics related to the history of American gardens. She is the author of Restoring American Gardens. Laura L. S. Burchfield teaches residential design, plant selection, and landscape management at The Ohio State University. She has Master’s degrees in both landscape architecture and horticulture from The Ohio State University and lectures and writes on many aspects of horticulture and landscape design. In addition she designs and installs residential landscapes for private clients.